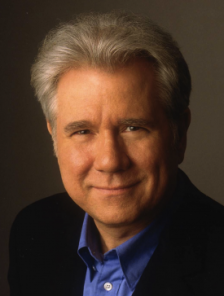 John Bernard Larroquette (born November 25, 1947) is an American actor, voice actor, stage actor and director. His most famous roles include the lecherous lawyer Dan Fielding on Night Court, manipulative psychopath Joey Heric on The Practice, mature and staid lawyer Carl Sack on Boston Legal and as the Annex's caretaker on The Librarians. Twilight Zone: The Movie - K.K.K. Sanford and Son - Murray Steinberg in the episode "Steinberg and Son"
Kojak - Sailor in episode "How Cruel the Frost, How Bright the Stars"
Three's Company - Cop in the episode "Jack Moves Out"
Remington Steele - Nathan Fitts in the episode "Breath of Steele"
Dave's World - Dave's Lawyer in the episode "Health Hath No Fury"
The West Wing - Lionel Tribbey, White House Counsel in the episode "And It's Surely to Their Credit"
House - Gabriel Wozniak in the episode "Son of Coma Guy"
Law & Order: Special Victims Unit - Randall Carver in the episode "Victims"
Breakout Character: His characters (especially Dan Fielding and Joey Heric) tend to stand out in spite of being a part of an ensemble cast. As such, he has received numerous accolades and awards for his roles. Old Shame: How he feels about Payne, a short-lived American version of Fawlty Towers. What Could Have Been: There were talks for his popular Night Court character Dan Fielding to receive his own spinoff, but Larroquette declined.